Poor communication resulted in a week of negative news stories this spring, when health and social care trusts announced their plans to close residential care homes across Northern Ireland. The announcements took place over several days and, in some cases, referred to the closing of all homes in a trust’s area. In contrast, Transforming Your Care envisaged the closure of 50 per cent of homes over three to five years. Health Minister Edwin Poots subsequently moved the power to close homes from the trusts to the Health and Social Care Board. The board will continue to gather views on the reform programme this autumn. “It will be critical to make the changes real for people,” a spokeswoman told agendaNi. 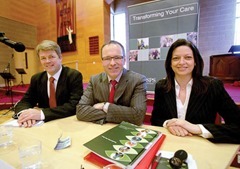 She was keen to see “open, honest and ongoing debates” about health and social care, which are informed by evidence. The phrase ‘engagement’ is regularly used throughout the public sector although its meaning is often unclear to members of the public. In this case, it refers to a range of ways for putting out the board’s proposals and hearing the public’s views. The Transforming Your Care website (www.tycconsultation.hscni.net) will be regularly updated with news and information about public meetings. Social media users can also find information at two online sources: facebook.com/tycconsultation and @tycconsultation on twitter. People without internet access, or who feel uncomfortable using the internet, can contact the TYC Programme Team by phone (028 9055 3790) or write to them at the Health and Social Care Board, 12-22 Linenhall Street, Belfast, BT2 8BS.